QR Codes have become tremendously popular over the last few months. Most companies use QR codes as a way to direct users to websites. Users can scan a code with their mobile phone, and the phone directs the user to the marketer’s webpage. The process saves the user time by eliminating the need for the user to type the web address into their phone. QR Codes are two-dimensional machine readable images. Much like normal barcodes, such as UPC codes, but with a much higher density of information, and significant redundancy/error correction. Any simple text can be encoded in a QR Code and then read by a machine using a scanner or camera. When I was doing some research on QR Codes I found they can be used for other purposes such as encoding VCARDs. VCARD files are simple contact or address book files saved as plain text. Most address book applications can save and open VCARD files with ease. Many QR scanner applications recognize QR codes with VCARDs as the encoded text. So, when I was designing my most recent personal business card I though it would be a neat idea to include a QR encoded VCARD on them. 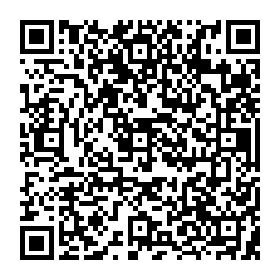 Any decent QR encoding software should be able to encode this. I used the one available at http://invx.com/code. Make sure the encoder encodes the text as the QR code, rather than encoding a URL that directs the user to a page displaying the text. 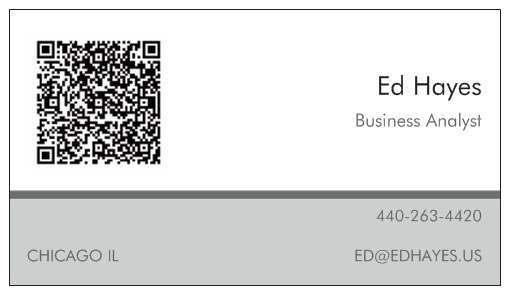 Finally I placed the encoded QR code image on my business card. Now, when I give my card to someone, they can scan it with their phone, and my contact gets added to their address book. Not only does this ensure that there are no typos, it’s much easier for the user to enter my contact information by scanning an image rather than typing on a tiny keyboard. Over the past few weeks I have been developing a business plan for a business I would like to open in the Lakeview neighborhood of Chicago Illinois. It has been quite the learning experience, but I have a lot more to do before it is completed. As it stands, I have a rough business plan generated and a preliminary cash flow statement. To develop the cash flow statement, I used my extraordinary Excel skills and created a tool that is quite robust. The tool has a multitude of settings including options for new or used equipment, leases, energy, Point-of-sale system, labor, and raw materials, among others. All which can be edited on a granular level, down to the cost of each raw material. Utilizing a bill-of-material, expected sales quantity, and retail price for each item, a revenue stream and cost-of-goods-sold is created to develop a net margin. Along side fixed costs, initial equity infusion, and loan payments, the tool can generate the first eight quarters of cash flow. It is quite the tool if you ask me! Hopefully in the future I will post the plan here to get some feedback. Until then, enjoy the rest of your day! It was like the doors from heaven opened up, and the light was shining on me! I could not have said it better! Neil’s comments reminded me of my work at a former employer.